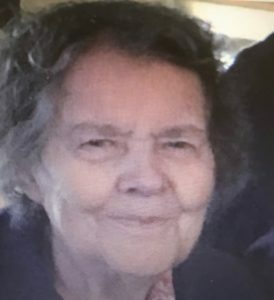 Frances Ethel Thompson, age 85, of Panama City Beach, FL passed away Saturday, March 23, 2019. Frances was born and raised in Philomath, Georgia. She loved people, especially her family. Frances always talked about her mom, dad and all her brothers and sisters. She always asked about her siblings up to the day she passed away. Lot of times we met on Friday nights to eat dinner and she would go by the bank and get several $20.00 bills to make sure that she gave everyone just in case we got hungry on the way home. Survivors include her sons David Thompson, Steve Thompson and wife Klanci; brother Max Armour; sisters Lillian, Sarah, Martha; grandchildren Jason Thompson and wife Stephanie, Christie Thompson and RylieClark Thompson; great grandchildren Autumn Thompson, Kaelyn Thompson, Brooks Thompson and Layne Thompson and a host of other relatives. She is preceded in death by her husband Mac Thompson, parents Herbert and Ethel Armour, brother Allen Armour and Norman Armour, sisters Kathryn and Betty Jane. Funeral services will be held 11:00 am Thursday, March 28, 2019 at Lawson Funeral Home Chapel. Interment to follow at White Chapel Memorial Gardens, Duluth, GA. Will Griffith will be officiating. The family will receive friends one hour prior to the services at the funeral home. Arrangements by Lawson Funeral Home, 4532 Hwy 53, Hoschton, GA, 30548, www.lawsonfuneralhome.org, 706-654-0966.